Are barking dogs a problem in your house? Does your dog think that barking is a sport... and they're determined win? Here's how to teach your dog to stop barking. Tried and true suggestions from dog experts! See how to desensitize your dog to the sounds that trigger barking -- so you can teach your dog to be quiet once and for all. One way to stop dog barking is to teach your dog the ‘quiet’ command. My dog used to bark a lot, until I used these tips to teach him how to be quiet. Here’s the best way to stop your dog from barking when the doorbell rings. See how to desensitize your dog to the doorbell. See how it’s done in this video. Have you been dealing with some bad dog behaviors lately? Is your dog causing you a lot of frustration and heartache? Here’s how to prevent and correct your dog’s bad habits. 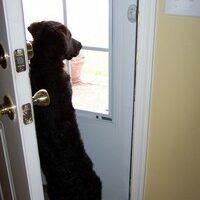 Does Your Dog Bark At The Doorbell? Halloween Is A Great Time For Dog Doorbell Training! A dog that barks at the doorbell is especially challenging at Halloween. However, you can look at it as a headache… or as a valuable dog training opportunity! This video shows how to do it. 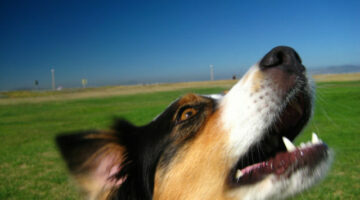 Human & Dog Communication Tips: Have You Given Your Dog A Job Lately? When trying to get your dog to do something, your dog doesn’t really understand what you are talking about. If you tell him what NOT to do, the message he gets is to DO exactly that! Here’s how to understand dog communication and use it to your advantage with your dog. According to Cesar Millan, the 5 most common dog behavior issues that owners face with their dogs are:Aggression toward other dogs, overexcitement or hyperactivity, barking while the owner is gone, barking at specific things, and problems on walks. See what Cesar Millan recommends for training dogs with those behaviors. Does your dog bark at the same noises all the time? Here are some tips for getting your dog to stop barking at those noises, along with tips for reducing your dog’s barking in general. In our case, any time the doorbell would ring, or someone would knock on the door, or a visitor would enter the house, our dog would go wacko. Same is true whenever he spotted a stranger or a dog out the window or from our fenced-in backyard. Here’s how we got our dog to stop barking. Do NOT Bring A New Dog Home Until You Watch These Cesar Millan DVDs! These 3 videos contain information that is helpful for new dog owners as well as lifelong dog owners — like myself. I learned so much from these DVDs… and I’ve had dogs all my life! I predict these Cesar Millan DVDs will be a lifesaver for lots of dog owners — especially those who have reached their peak level of frustration and don’t know where else to turn. 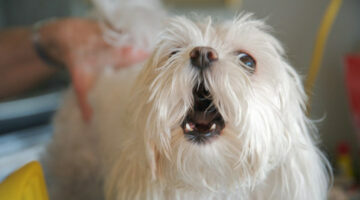 See how we taught our dog to sing on cue. Ever wonder what dogs would do different if they ruled the world? Here’s how a dog sees life and recommendations from a big dog to a little dog at ‘Dog School’. We use ‘Tell me’ whenever we want our dog to get our attention about something. This is helpful when getting your dog used to the idea that he must ‘tell you’ when he needs to go outside, when there’s a stranger nearby, when he’s hungry, when the water bowl is empty, when the mail has arrived, etc. For the dog lover who has everything… The following electronic gadgets will give dog owners peace of mind, a way to communicate, and a fun way to stay organized. These items can be used whenever you’re away from your pet, you want to keep tabs on your pet, or you just want to have at hand everything there is to know about your dog — all in one place. Here are some fun dog ringtones for your cell phone. Want your phone to ‘ring’ with a barking dog sound?… Check these out… Plus, lots of cute & colorful dog pictures that would make a great background or wallpaper on your cellphone, too.